This will be the largest exhibition on Van Gogh and Edvard Munch ever mane so far. Check it out in the Munch museum from May 7th till September 6th, in 2015. Van Gogh was a Dutch Post-Impressionist who was born in 1853 and he died in 1890. He is one of the most outstanding painters of the Post-Impressionists and his art work had a great influence of the upcoming generations’ art works. Edvard Munch was a Norwegian Symbolist painter who was born in 1863 and died in 1944. Munch had a great impact on the German Expressionism in the early 20th century. His most famous painting is The Scream which he painted in 1893. This exhibition shows the similarities between the two painters through their paintings. The exhibition will present more than 100 paintings including the biggest masterpieces of the two painters. Both of them had a really unique way, style and technique at painting. 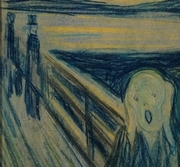 The exhibition Munch and Van Gogh will be held at the Munch Museum in Oslo from 7th May in 2015 until 6th September in 2015, and then it will move to the Van Gogh Museum in Amsterdam from 25th September in 2015 to 17th January in 2016. This information is taken from the following article in the Amsterdam Guide.